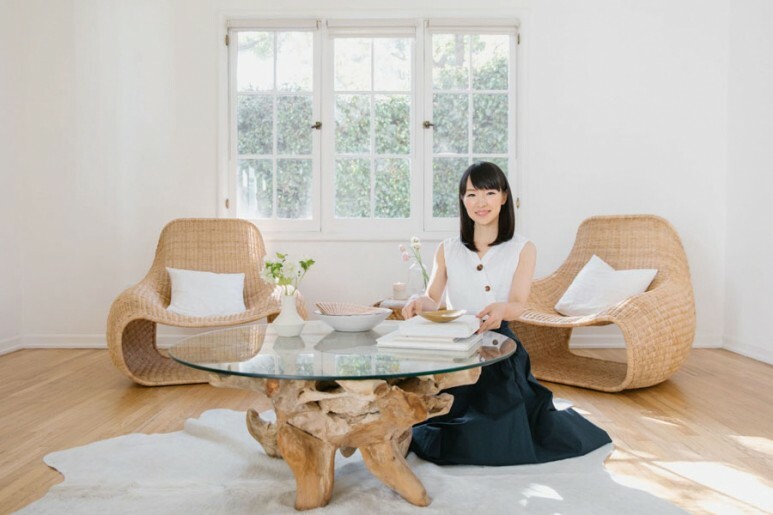 At times, this even manifests itself in the physical world… I find myself in the middle of a messy house and messy mind, and tidying up really helps me think clearly! Why? To some it may seem obvious why you’d want to employ a systematic approach to managing your work, but to others it may not be. There’s the old adage time is money that we’ve grown tired of hearing. But it’s true! We’re not very accustomed to thinking about the cost of our efforts on a more granular level (e.g how much it costs me and my team to be in this hour-long meeting), but we should be more aware of it. Time is money and we should be spending our time on the activities that will bring more value or have the most impact. There are three concepts that frequently come into play when I think about managing my workload: time management, prioritisation and productivity. Time management refers to how you plan and organise your activities around a certain timeframe. Good time management can help you work more efficiently and effectively, getting more done in less time. Prioritisation is a relative activity which involves determining which activity takes precedence over others based on criteria such as importance, urgency and impact. Lastly, the Cambridge Dictionary defines productivity as “the ability to do as much work as possible in a particular period”. Although measuring outputs can be helpful (i.e measuring the amount of things done), a more useful way of measuring productivity is the amount of useful and/or valuable things done in a consistent and sustainable pace. Understanding how you approach each of these concepts can help you determine the strengths and weaknesses of your current ways of working. With this self-awareness, you can focus on small improvements that set you on a track to work more efficiently and effectively. Impact vs Effort Matrix. Source: Edraw. For now, I am going to take you step-by-step through the Impact vs Effort Matrix I use to manage my workload. 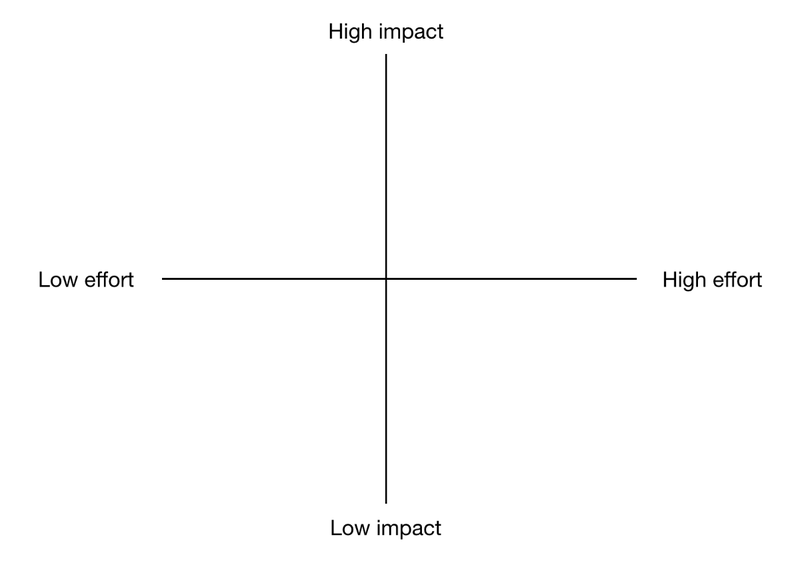 The Impact vs. Effort Matrix is a useful tool for decision-making that can be used individually and in groups. It takes into consideration the amount of effort required to carry out something compared to its potential impact. Write each task on a post-it. You may have different types of tasks such as one-off tasks, routine activities (like business-as-usual), projects, and problems-to-solve: make sure you write everything down, even the smallest of tasks. 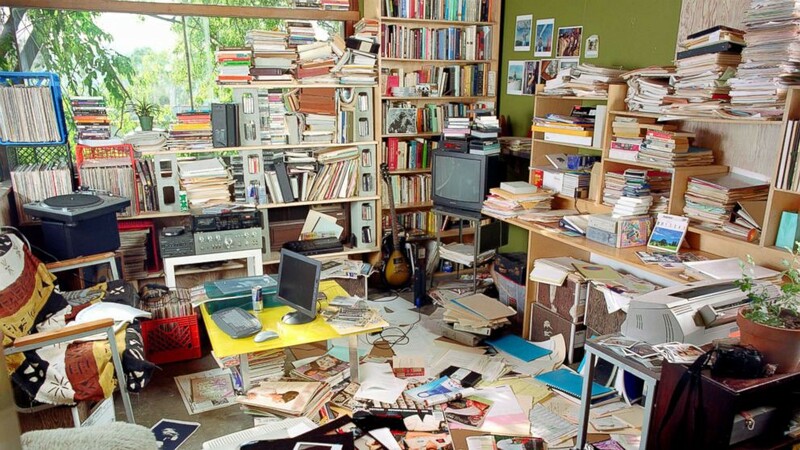 If a task won’t take longer than two minutes to complete, set them aside in a separate pile. If a task has a completion date, add the date to the post-it. This will help you with comparing and prioritising your work. Gather as much information you have on each task. Make sure you are clear on the “why”, “what” and “who”. If you have any idea of the “how”, include that too — even if it’s just the first step. You may want to use a user story format to shape the task description: “As a <person/user/audience>, I want <a goal>, so that <some reason>”. Or, if you want to break the task down into smaller components, use the INVEST acronym. Before you begin, make sure you are clear about what impact and effort means to you so that you can objectively compare pieces of work. For example, when thinking about effort, you might consider different factors such as time, complexity and uncertainty. On a clear table, draw one vertical line for “impact” and one horizontal line for “effort”. Start off with a task that you are clear about what it involves. Place the post-it on the impact vs. effort matrix. Then, pick up another post-it and place it on the matrix; think about how it compares to the task you put down first. Then, repeat until you’ve gone through all tasks. Tip: if your post-its end up in one quadrant, move the axes so that they are better distributed across the matrix. 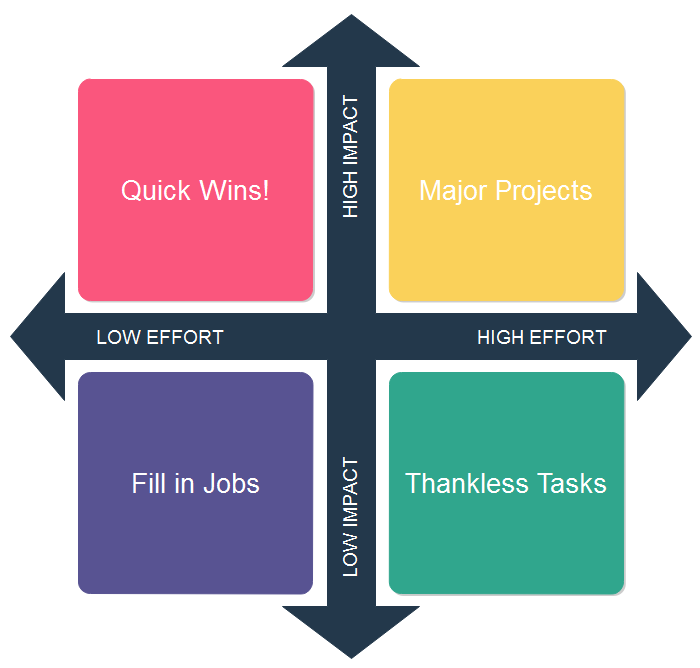 Start with the quick wins: tasks that are in the lop left quadrant. These should be done first as they have a high impact but take less effort. The tasks in the top right quadrant are your larger projects — they will need more planning and possibly breaking down into smaller tasks. Ask yourself if there are any opportunities to reach the same impact with less effort. Maybe you can use a test and learn approach to determine the best way forward? The tasks in the bottom left quadrant are your “fill in” tasks. Determine whether you can delegate this, or if there’s anything you can do to improve its impact. The tasks in the bottom right quadrant are “thankless tasks”. Ask yourself if these really need to be done — avoid them as they aren’t impactful and require too much effort. Or, eliminate ruthlessly! Create a prioritised list of your tasks based on the above step. 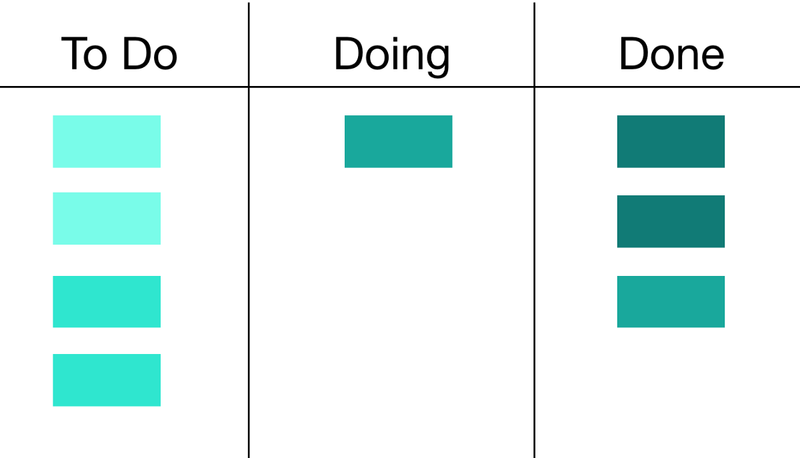 Use a simple and use a simple “to do”, “doing” and “done” board to move through your tasks. Avoid multi-tasking — focusing on one task will help you move things to “done”. With fresh eyes, take another look at your 2-minute tasks pile. If there is anything that you think isn’t worthwhile, don’t do it. Then, book 10-minute slots in your calendar for the rest. Repeat until you have got through all the small tasks. Go back to your prioritised list and put some time in your calendar to work on the quick wins. Give yourself some slack — if you think you’ll need more time to plan a task or follow up on it, make sure you’ve put in time for that too! Once you’ve got through the quick wins, you can then go in to more detailed planning for your “major projects” quadrant. Revisit your list regularly to make sure your are focusing on what matters. Repeat this process regularly and adapt this technique to better suit your ways of working. You may find it helpful to incorporate other methods like the Pomodoro Technique to help progressing your tasks. A quick Google search on productivity hacks will get you inspired. Agile Coach, museum geek and lover of all things fabulous.